Why do we need to Detox ? As part of our usual body functionality we naturally detoxify every day. Eliminating toxins and waste via our kidneys, liver, colon, lymph glands, lungs and skin. Toxins can be found in our everyday environment; tobacco, alcohol, food additives, drugs and anesthetics, pesticides, heavy metals and industrial pollutants. We need our body to function optimally and rid our systems of these toxins as they are harmful waste products which attack our immune system and can cause a wide variety of side effects, including; lethargy and tiredness, headaches and migraines, colds and flu, bad skin, breath and body odor problems, sinus problems, the list goes on. In fact, some theory exists to suggest that detoxification may at some point be suggested as an alternative to the prevention of immune deficiency diseases. Our body is a very complex piece of engineering but in its simplest form is a collection of cells and tissue. Cells consist of electrical charges and ideally contain an even proportion of positive and negative ions. In this ‘ideal’ state we are perfectly balanced and our body functions by removing toxins and absorbing nutrients from food, water and oxygen. When the body experiences any form of trauma, which can be caused by poor diet, ill health or injury the cells become more positively charged and consequently do not work as effectively and the process of storing toxins begins. Even a lack of exercise promotes toxic build up as our cells are insufficiently oxidized. Therefore stagnation of our natural detoxification process occurs. How does the Ionic Detox Foot Bath work? While immersing your feet in the foot bowl, a series of timed positive and negative ions that the system emits, invigorates, re-conditions and synchronizes the body’s natural ionic flow. The result is that your body can detox safely and at it’s own pace by mobilizing residues and waste stored within the body. This detoxification happens mainly after the treatment and is likely to take place via the organs of detoxification i.e. the kidneys, liver and skin. Short Treatments of 15 or 30 minutes in 72-hour + cycles have generated best results in clinical trials. There is no discomfort whilst having the Treatment, the entire process takes 30 minutes for adults and is completely safe to use. It is however, not recommended for pregnant ladies, anyone with a pacemaker or an organ transplant. It is indeed a pleasurable experience. You will be astounded and curious as the water changes from clear to lightly colored, then to darker shades. There are many reasons why the water changes color, when the system is activated it creates an electrolytic flow within the water, substances that are present in the water such as salt, chlorine, magnesium, copper, detergents will influence color change. Also anything present on the skin such as bacteria, dead skin cells and fungal infections will also influence the color change. That is why the color change can vary from person to person and from treatment to treatment. What does the water color change really mean? When the water becomes excited it ejects some tiny particles, which become visually observable in the water and tend to make the water look dirty and brown. How dirty the water becomes is related to how much sediment is in the water. When you test a bucket of water to see this phenomenon with no parts of our body in the water, how dirty it becomes will generally be the same each time you use a new bucket of water from the same source. If you were to run this test over and over again but with a different person’s feet in the water each time, what happens to the water can be amazingly different. Sometimes the water can be dirtier, and sometimes cleaner. Because everybody’s ability to absorb energy is different, the reaction of the water is also going to be different. Remember, good health, better energy ability; poor health, not so good energy-wise. Note however although the color changes in the water can be dramatic, it is not the most important factor. One must be very careful about making any judgments based only on the water color. Some water does not change color and it is not always an indicator of whether energy is being produced. The best indicator that may be found after a treatment would be an oily substance located on the container at water level. It generally contains materials released from the outer layers of the skin. Another indicator after treatment can be found in the color change in the urine of the individual treated. It is important to eat a variety of colorful foods in order to assure balanced chemistry in our bodies. Every color is chemical and has a chemical value. Chemical components of food contribute to their acid-alkaline balance. As a general rule, green food nourishes the immune system, especially the liver and the gallbladder. Red food nourishes the endocrine system, including the pituitary gland, as well as the heart and small intestines. Orange food nourishes the joints. Yellow food nourishes the digestive system, including the spleen, stomach and pancreas. Yellow-green food nourishes the kidney, bladder, urinary tract, female/prostate area. Brown food nourishes the liver. White food nourishes the respiratory system, namely the lungs, and also the large intestine, lymphatic system and skin. Black food nourishes the circulatory system, kidneys, liver, gallbladder and bladder. In a similar manner, color may be an indicator of different toxins being released from specific body systems into the water. White foam is thought to indicate mucous from lymph. White cheese like particles indicates probable yeast. 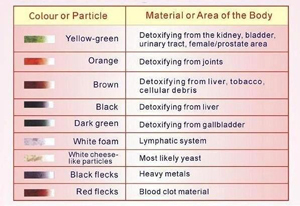 Black flecks may indicate heavy metals. Red flecks may indicate blood clot materials. By the same token, when the water is changing colors, each color represents the part of the body that is being detoxified. One of the most visual effects is the discoloration of the water. Some of what you see happening with the water is related directly to the water being used.